Recently, we cut down three small sassafras trees from our yard. I knew you could make tea from the roots, but wondered if there was anything else you could do with it. SURPRISE! 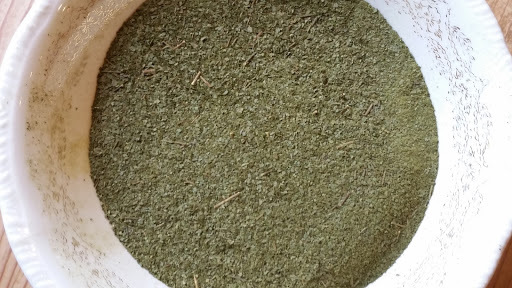 File’ powder is made from dehydrated sassafras leaves! I had no idea! This could not be any simpler. Wash the leaves and dehydrate until completely dry. I used the Excalibur at 135 degrees for 12-14 hours. You could use your oven or even air dry for a few days. Just make sure there is no moisture left or the powder will mold…not good. Once they are completely dry, grind them up in a coffee grinder or something similar that will pulverize into a powder form. How easy is that? Now to find a recipe to use my file powder in!